Exit the motorway at Junction 24 and follow the signs to East Midlands Airport. At the roundabout [Donington Park Services], take the third exit [signposted to East Midlands Airport]. At the next roundabout, go right. The Holiday Inn Express will be on your left hand side. At the next roundabout go straight over. Follow this road and you will then come to the first entrance to the Air Cargo Centre on the left. Take this turning and follow the road round [the road will bend to the right] and we are at the bottom, number 72a. 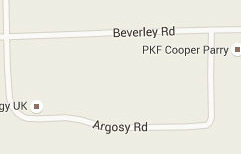 If using a SAT NAV please use ‘Argosy Road’ and not rely on the Post Code as it will take you to the Airport car park.